By freezing the Russia-favoured South Stream gas pipeline project, Sofia had no ability to refuse the Brussels-imposed sanctions on one of its largest trade partners, writes Szilvia Batkov. Szilvia Batkov is an international journalist, running the English language website of Bulgaria’s daily Standart. The general opinion among Bulgarians is that Bulgaria and its people were simply used as the “pawn” in the chess power game of the EU/US vs Russian gas interests. Bulgaria’s links with Russia run deep – whether it be the influence of Russian business, or the tens of thousands of Russian citizens who own second homes along the shores of the Black Sea. And there’s something more – a shared cultural heritage, such as the Orthodox Christian religion and the similar language. Even the head signs are the same: a nod for yes and a shake for no. Last year, more than a quarter of the 2.6 million tourists who came to Bulgaria were Russians – a number likely to fall in future due to the cooling relations. For the majority who feel they lived better in the Socialist times, the death of the South Stream is a tragedy, a missed opportunity. Even worse, by failing to act independently from the EU, Bulgaria has now “pissed off” Moscow, they say. 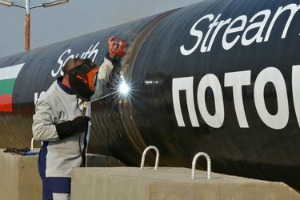 According to Standart daily’s poll, 58% of the respondents believe that stopping the South Stream is a loss for Bulgaria. On the other hand, 33.97% are adamant that Bulgaria will not feel the lack of the pipeline, with the remaining 7.46% believing that though the country has lost some money, the EU will compensate the amount. My own poll at the Slaveykov book market in Sofia’s centre showed roughly the same result: out of the ten people agreeing to answer the same question, six believe that Bulgaria has missed a unique opportunity. “Bulgaria should choose one path and follow it, instead of constantly switching sides. The Russians were ready to pay tons of money and we chased them away,” Stoyana, one of the booksellers, noted. It turns out that she was born in the northern region where the pipe was supposed to pass through. On the other hand, the anti-Russia camp, along with pro-Western media, is celebrating the victory of Bulgaria’s sovereignty and that of the European values over the dictatorial influence of Moscow on Sofia via the country’s oligarchs. They emphasize that South Stream was surrounded by corruption rumors and many blurry spots – such as the exact price for which Bulgaria would have bought the gas from Russia. Yet, for Bulgaria, a country where two set themselves on fire out of economic despair just in the past few months, the direct and fast money from Russia was literally a matter of life or death. Desislava from Pernik had been sent away from the emergency ward, because she had no BGN 10 (€5) to pay to to remove a tick from her leg. Lidia, a photographer and a mother chose, to become a living torch in front of Bulgaria’s Presidency in Sofia, as she wasn’t able to pay the bills anymore. The planned pipeline was supposed to pass through the country’s (and the EU’s ) poorest region. The project gave those people at least some hope with its promise to create 2,200 jobs. Just like the pipeline, this promise is also most likely gone now. The country has already been devastated by the EU-ordered sanctions against Russia. Trapped between the EU and Russia both physically and economically – and depending on both, Bulgaria has only reluctantly gone along with the trade restrictions. Sofia simply had no ability to refuse the Brussels-imposed sanctions on one of its largest trade partners – exactly as it happened in June, with the country’s decision to suspend South Stream. This decision which was by no means voluntary. The European Commission started an infringement procedure against Bulgaria over the pipeline’s alleged non-compliance with the union’s Third Energy Packet, and froze nearly 2 billion Euros (USD 2.6 billion) of EU funds. The move was perceived by most Bulgarians as blackmail. Besides the EU, Washington was pushing to stop the pipeline. Bulgaria’s then-PM Plamen Oresharski decided to suspend works on the pipeline in June right following a visit of three US Senators led by John McCain. See our previous article to find out why the US had good reasons to stop the pipeline. Bulgarian PM Boyko Borissov, on the other hand, is well known for having close ties with Washington. When the project got suspended in June, perhaps not surprisingly, he was commenting on the events from Washington. In 2009 as PM, Borissov insisted on postponing construction of the South Stream pipeline for several years. However, once back in power in 2014 and confronted by Bulgaria’s dire financial situation, Borissov was fast to run to Brussels in an attempt to save the project after Putin’s announcement. Instead of the pipeline, he’s now planning a hub for the Russian gas in order to avoid clashing with EU regulations. “Then we will make our own pipe. Nobody will tell us with which companies, why, how – whether it is three, five, how many billions, it does not matter,” the PM noted angrily in an off-the-record interview with Standart. “Russia’s decision to give up South Stream is deeply disappointing and disastrous for Bulgaria,” PES President Sergey Stanishev commented. However, knowing Russian stubbornness it is highly unlikely that they would forgive Bulgaria’s betrayal, which, according to Russia, started when Bulgaria dropped the purchase of Russian warplanes in favor of NATO fighters earlier in 2014.